When repairing or troubleshooting a circuit, a multimeter is your best friend. 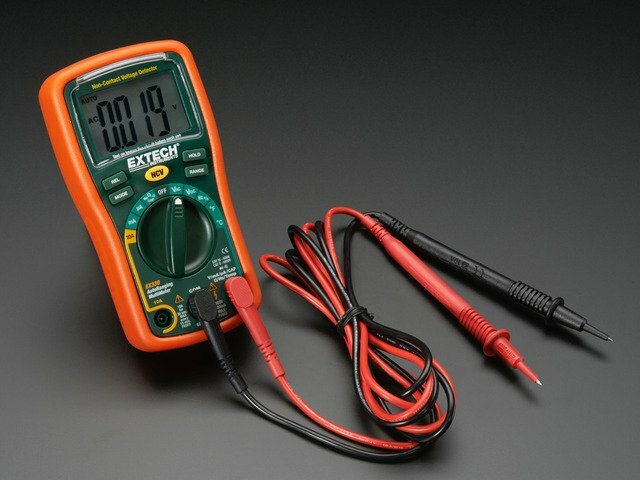 The multimeter takes abstract concepts such as voltage and current and makes them real by giving us the ability to measure them. This particular model is a “manual-range digital multimeter”. “manual-range” meaning that I need to set the particular range of values I want to measure. and “digital” as it uses a digital display to show readings. … allow you to simply set the type of measurement you want to make without the need to specify a value range. Collin: Analog meters don’t have a digital display, instead they use an old-fashioned mechanical needle to show values. Collin: Indeed, Ladyada - that is a rather *large* analog multimeter. Ladyada: Actually, this meter only measures current, so we call it an “ammeter”. It’s the ancestor to the modern multimeter. Collin: No doubt - and when was that made? Ladyada:The basic design hasn’t really changed much - there’s a numerical display, a dial, and two terminals to connect to a circuit. Which reminds me - how does one use a multimeter to test a circuit? 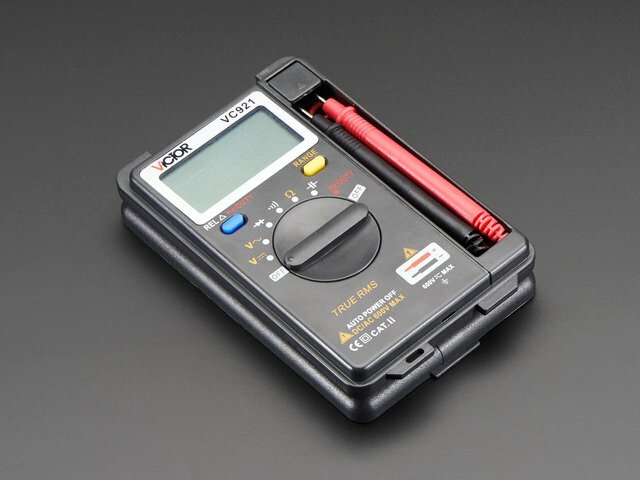 The simplest way to use a multimeter is for testing continuity, whether 2 points are electrically connected to one another. This is incredibly useful when checking for solder bridges and other shorts within a circuit. Connect one test lead to the common ground terminal and another to the terminal on the right. Then connect the leads to each point in the circuit we want to test for continuity. If the multimeter detects conductivity between those two points it will produce an audible beep. … no beeping shall occur. Ladyada: Here’s my Ladyada tip for using continuity mode in a multimeter. Especially in a loud office where you can’t hear the beep, cradle it against your ears and that way when you do a continuity test you’ll hear it nice and loud. To measure the amount of resistance between two points, set the dial to the lowest resistance setting and connect the test leads to each test point. If the multimeter simply displays the numeral “1” and a decimal point, that tells us the that the resistance we’re trying to measure is beyond the range of our current setting. Keep increasing the range setting until the meter displays multiple digits. This number is our resistance reading within the current range. The dial is currently set to a “KΩ” or thousands of ohms range, so we have a resistance of 9.88 thousand ohms. You may find yourself in need to measure the resistance of a very small component like this surface mount resistor here - and these multimeter probes are way too big. in that case we suggest “smart tweezers”. Ladyada: Smart tweezers are basically a digital multimeter, except instead of wire probes, there’s two pointy tips. Grab the component with the two tweezer tips, then you can read the value off of the LCD. Testing voltage is similar to testing resistance, but first we need to set the meter’s dial to either a *DC* or *AC* voltage range. Here, we’re testing a battery so we’ll use the DC ranges. Since I know this battery is supposed to provide 9 volts, I’ll choose the lowest range that has a maximum value above 9 volts - so 20V, in this case. It appears this 9 volt is not quite living up to its name with a reading of around 4.3 volts. Sorry buddy - you don't have to go home, but you can't provide current here. Don’t forget, if you want to measure voltage inside of a circuit, it has to be plugged in and powered. If I have to measure a lot of voltages in a circuit, I like to use a probe multimeter. After you connect the ground contact, you can probe any voltage you want and see the result on the LCD. Measuring current can be a little trickier than measuring voltage or resistance because we need to send the electrical signal through our multimeter and it can only handle up to a certain amount of electrical current before blowing one of its internal fuses. While the terminal on the right can handle up to 10A, but it won’t detect relatively small amounts of current. If you’re unsure of the maximum amount of current you’ll be measuring (but you know it’s below 10A) start with the higher rated terminal on the left & set the dial to the highest Amperage range. Route electricity through the multimeter by creating a break in the test circuit and connecting the test leads across the break. If the multimeter displays a reading of zero Amps, we can safely switch over to using the lower rated terminal and the next-lowest range. Keep decreasing the range until you see a reading of multiple digits. So we can see now our circuit is using 15mA of current - and our multimeter’s fuses are safe & sound. It’s pretty common for people to blow the fuse on their multimeter when testing current - but luckily it’s really easy to replace. Start by turning off the multimeter and removing the leads. Unscrew any screws in the back and open up the battery case. There might be some screws you have to undo. Then turn it over and remove the body from the plastic casing. You’ll be able to see the two replaceable fuses inside. Check which one’s blown and go to your local hardware store for a replacement. Those are the essential things you can measure with a multimeter - but many meters also offer the ability to measure capacitance, frequency, or even temperature. Still others have evolved to be quite small and portable. Now if you'll excuse me, I'm off to do a bit of testing. This guide was first published on Jun 11, 2014. It was last updated on Jun 11, 2014. This page (Transcript) was last updated on Mar 29, 2019.